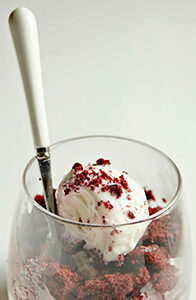 This beautiful, easy, icy cool take on a deconstructed red velvet cupcake can completely assembled in advance and frozen. Allow to sit at room temperature just a few minutes before serving. To prepare cake- Prepare Manischewitz® Red Velvet Cake according to package directions. Set aside to cool. To prepare the ice cream- Blend the cream cheese, milk, lemon juice, contents of frosting packet, and salt in a food processor or blender until smooth. Pour into the bowl of an ice cream maker and freeze according to manufacturer’s instructions, about 30 minutes. Enjoy immediately for soft serve, or allow to harden a bit longer in the freezer for hard scoop ice cream.